In the 1950s mass revivals held in tents, stadiums, or large auditoriums became common throughout America. Mass tent revivals were begun in the Mennonite churches when George B. Brunk II, a graduate of Union Theological Seminary (Richmond, Virginia) and ordained preacher, joined forces with his brother Lawrence, who served as business manager and song leader for their campaigns until 1953. Their first series of meetings began in June 1951 at [[East Chestnut Street Mennonite Church (Lancaster, Pennsylvania, USA)|East Chestnut Street ]]in Lancaster, PA, and continued for seven weeks. It was followed that summer and fall by campaigns at Souderton, Pennsylvania; [[Orrville (Wayne County, Ohio, USA)|Orrville, Ohio]]; [[Manheim (Lancaster County, Pennsylvania, USA)|Manheim]], Pennsylvania; and, during the winter, in Sarasota, Florida. The meetings quickly became inter-Mennonite. A spring 1952 campaign in [[Johnstown (Pennsylvania, USA)|Johnstown, Pennsylvania]], was followed by a July campaign in [[Kitchener-Waterloo (Ontario, Canada)|Kitchener]], Ontario, cooperatively sponsored by the Ontario Mennonite Conference (MC) and local churches, including the Amish Mennonites, Mennonite Brethren, the Stirling Avenue and United Mennonite congregations (GCM), the [[United Missionary Church|United Missionary Church]], and the Brethren in Christ. 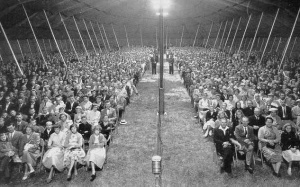 In the 1950s mass revivals held in tents, stadiums, or large auditoriums became common throughout America. Mass tent revivals were begun in the Mennonite churches when [[Brunk, George Rowland (1911-2002)|George B. Brunk II]], a graduate of Union Theological Seminary (Richmond, Virginia) and ordained preacher, joined forces with his brother Lawrence, who served as business manager and song leader for their campaigns until 1953. Their first series of meetings began in June 1951 at [[East Chestnut Street Mennonite Church (Lancaster, Pennsylvania, USA)|East Chestnut Street ]]in Lancaster, PA, and continued for seven weeks. It was followed that summer and fall by campaigns at Souderton, Pennsylvania; [[Orrville (Wayne County, Ohio, USA)|Orrville, Ohio]]; [[Manheim (Lancaster County, Pennsylvania, USA)|Manheim]], Pennsylvania; and, during the winter, in Sarasota, Florida. The meetings quickly became inter-Mennonite. A spring 1952 campaign in [[Johnstown (Pennsylvania, USA)|Johnstown, Pennsylvania]], was followed by a July campaign in [[Kitchener-Waterloo (Ontario, Canada)|Kitchener]], Ontario, cooperatively sponsored by the Ontario Mennonite Conference (MC) and local churches, including the Amish Mennonites, Mennonite Brethren, the Stirling Avenue and United Mennonite congregations (GCM), the [[United Missionary Church|United Missionary Church]], and the Brethren in Christ. A second Mennonite tent revival unit was sponsored in 1952 by Christian Laymen's Tent Evangelism, Inc. (CLTE), with headquarters in Orrville, Ohio. Howard Hammer, formerly a [[Church of the United Brethren in Christ|United Brethren in Christ]] minister, was the first evangelist, followed in 1955 by Myron Augsburger, when Hammer went to [[South America|South America]] as a missionary. Andrew Jantzi, an evangelist from the [[Conservative Mennonite Conference|Conservative Amish Mennonite Church]], led a third organization which was largely confined to his own denomination. A fourth organization, Mennonite Evangelical Crusades (sponsored by the [[Virginia Mennonite Conference (Mennonite Church USA)|Virginia Mennonite Conference]] [MC]) held four campaigns in 1956 and one in 1957 with A. Don Augsburger as speaker. Beardsley, F. G. <em>A History of American Revivals.</em> New York, 1904. Bender, Harold S., Ernst Crous, Nanne van der Zijpp and Beulah Stauffer Hostetler. "Revivalism." Global Anabaptist Mennonite Encyclopedia Online. 1990. Web. 24 Apr 2019. http://gameo.org/index.php?title=Revivalism&oldid=135773. Bender, Harold S., Ernst Crous, Nanne van der Zijpp and Beulah Stauffer Hostetler. (1990). Revivalism. Global Anabaptist Mennonite Encyclopedia Online. Retrieved 24 April 2019, from http://gameo.org/index.php?title=Revivalism&oldid=135773.